Peanut butter is one of the favourite things people like to have for breakfast or lunch. You can use it with bread or whatever you like and enjoy the taste of roasted peanuts to start your day. 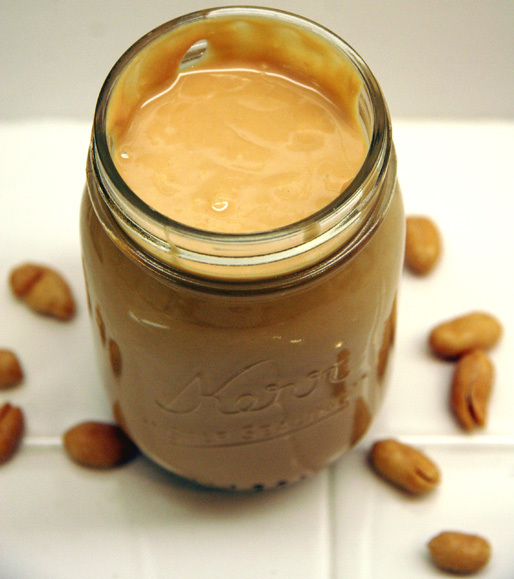 Follow some simple instructions to make homemade peanut butter. In the first step you need to spread all the peanuts that you have on a baking pan and then bake them in an oven for 6 to 8 minutes at 350 degrees. Keep shaking them after every two minutes just to make sure that the peanuts do not burn. The key here is to avoid letting the peanuts turn black because you will then have to throw them out because of their poor taste, so pay full attention when you are baking the peanuts. Now take the pan away from the oven and allow these roasted peanuts to cool down. Now put these roasted peanuts in a grinder and add 1 1/2 tablespoons vegetable or peanut oil in it. You should cover the lid of the grinder and turn it on. Keep it running for about two to three minutes until you see the mixture take the shape of a ball in the grinder. Remember you have to make sure that the peanuts are properly ground so that there aren’t any hard crusts in your homemade peanut butter by the time you finish. The mixture can get stuck on the sides of the grinder and for that it is important that you stop the grinder, open the lid and scrape the peanuts down with the help of a spoon. Once you have scrapped all that was stuck on the sides close the lid and turn on the grinder. Now continue until you achieve smooth peanut butter. Taste this peanut butter and add a pinch of salt or some sugar according to your taste. If you want a sweeter taste then it is advised that you add brown sugar, molasses, or honey and mix it for a while. You can now spoon this peanut butter in a jar and cover the lid so that it is airtight. Leave it in refrigerator for a day or two so that the mixture can settle in before you start using it.